Getting a job in fashion is not easy. In fact it’s one of the most competitive industries to get into. Millions of fashion students are hoping to bag that dream career, but exactly what does it take to land yourself that ultimate gig? Research the brand you’re wanting to work for and make an effort to present the brand in small ways. If they are a minimalist brand wearing a technicolour coat to the interview is probably not the best strategy. Recruiters are looking for hungry team members. They will look at all internships, volunteer work and relative work experience. Make sure you appear hungry. A general knowledge of the brand its origins is key when applying. Make sure you spend a good amount of time doing your background research before you attend the interview. Both these industries represent glamour and a designer lifestyle but in reality, both these industries are notoriously underpaid. Keep that in mind when you get to the negotiation point of interviewing. Be careful what you share with a potential employer. Examples of your own work and folio are totally acceptable. Cost sheets, financial information or the discussion of a previous employers upcoming range or brand initiatives is a no-no. Advanced Diploma of Fashion Design & Merchandising – Teaches technical and fashion business knowledge require in the fashion industry, while developing students personal design talents. With business skills integrated into the course the emphasis is on the design and production of a collection of garments suitable to launch a new label. 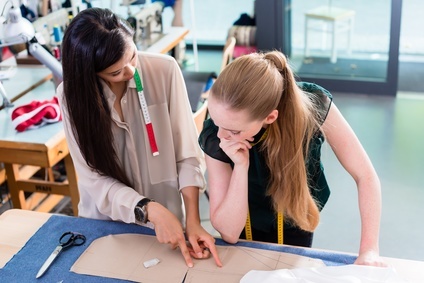 Bachelor of Fashion Business – The FIRST undergraduate degree in Australia to cover all aspects of the international fashion industry from; creative, technical, organisational and business subjects. It also is the only fashion program that doesn’t require students to undertake a design class (sewing and pattern making) making it perfect for those who want to have a career in buying, merchandising, marketing and styling. Diploma of screen & media – Teaches students how to design, apply and remove makeup for a range of different applications, as well as special effects makeup, prosthetics and styling wigs and hair. This course provides the foundation to work across a range of creative disciplines as a makeup design and special effects professional. Diploma of Beauty Therapy – Designed to teach students the necessary skills and knowledge required to become a professional beauty therapist. Students learn to perform a variety of beauty services including facial treatments, body massage and treatments, hair removal, lash and brow treatments, nail and makeup services. Graduate as experts in skincare, with a thorough understanding of how nutrition and well-being can affect the skin and body. Certificate III & IV in Hairdressing and Certificate III in Barbering – Barbering has made a huge comeback in recent years. This course equips students with the skills to perform a variety of barbering techniques both traditional and modern including clipper/scissor over-comb, taper, graduated and layered cutting styles. Diploma of Salon Management – The ultimate management qualification, providing students with the pathway to work as a salon manager in any type of personal services business including hairdressing, beauty salons, barber shops and spas.